Does your business require a fleet solution that offers exceptional durability, fuel economy and value for money? 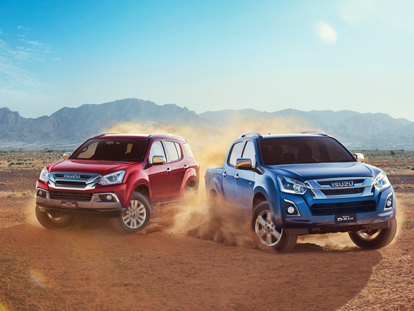 Whether you’re part of a large corporation or a small business owner, we offer a great selection of New Isuzu UTE vehicles that are built to suit all aspects of your business. Our Isuzu D-Max and MU-X vehicles come in a range of variants, so we are confident we can organise a fleet package that is tailored to suit your needs. Our Isuzu UTE fleet vehicles are serious about safety, and offer extensive active and passive safety features for your protection. To provide our corporate customers with complete peace of mind, our fleet vehicles come with Isuzu UTE’s Service Plus comprehensive care package. To speak with a member of our fleet department to discuss a fleet package for your business, please don’t hesitate to Contact Us today.